Sitting on the rock of the bay? It may be one of the biggest new tech brands on the planet, but we're hoping it's safely mounted on a helmet as GoPro goes through its first rocky patch . The company spent a whopping $34.7 million (£20.5m, $AU37m) on research and development, double its previous levels and the cost of its initial public offering (IPO) also bit. That makes the holiday period ahead of Christmas has become a very big deal indeed for the extreme video giant as it looks to claw back some of its value. 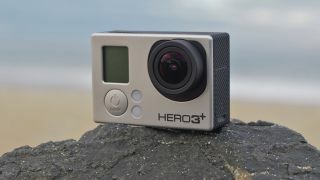 And we'll hopefully see the upside of all that spending soon, with the company looking to build on the success of products like the critically acclaimed GoPro Hero3+ Black edition. For those wondering if buying a GoPro is now a bit of a risk, it's probably worth remembering that since the company's share price had doubled from their initial valuation so this is, so far, just a bump in the road rather than a video nasty.